Dr. Schaefer has been practicing medicine in Worcester since 1990. He received his undergraduate degree in Biological Sciences from Cornell University, and then his MD degree from Dartmouth Medical School. 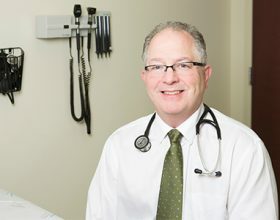 After an internship and residency in Internal Medicine at the Dartmouth-Hitchcock Medical Center, Dr. Schaefer completed a one year fellowship in General Internal Medicine at DHMC. Following that he moved to Worcester where he completed a fellowship in Pulmonary & Critical Care Medicine, and received extensive training in Allergy & Immunology under the tutelage of Dr. Helen Hollingsworth. He continued to practice Pulmonary Medicine, Allergy and Critical Care Medicine at the UMass-Memorial Medical Center for over 18 years before joining Mass Lung & Allergy, PC in March 2009. Dr. Schaefer is a Clinical Associate Professor of Medicine at the University of Massachusetts Medical School. He is the Director of the Adult Cystic Fibrosis Program at the UMass-Memorial Medical Center. He is board certified in Internal Medicine, Pulmonary Disease and Critical Care Medicine.